Laura's versatile performance background started with the precision of a Kilgore Rangerette officer in 1962, the fun of Six Flags Over Texas shows, followed by the discipline of the TCU Ballet Department. 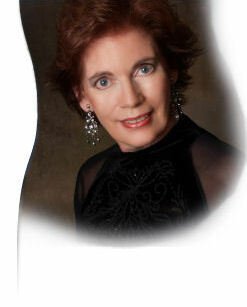 She has danced with both the Fort Worth Opera Association and San Antonio Opera. Other dance credits include appearances on the Southwestern Bell TV Show and performing artist for the Texas Historical Society. After completing her BFA in Ballet-Theater and MFA in Speech-Drama from TCU, Laura has been a choreographer, professor, singer and pianist. Laura began studying piano at the age of 9 in her hometown, Atlanta, Texas. She was classically trained. Her teacher, Mrs. W. O. Harden, insisted that she learn music from the Romantic, Classical, and Baroque Eras. Early knowledge of the impressionist, Debussy, and the 20th century greats such as Sibelius were familiar studies for this young student. While attending TCU for advanced degrees, Laura continued to study classical music with Lilita McCorkle, prominent member of the music faculty. Laura's musicianship reveals that she is equally at home with Minuets, Romantic Waltzes, Ragtime, Oriental and Pop. Music played without modification can be dull and lifeless. With this in mind, Laura combines technique with melody to create her own arrangements of many song styles familiar and new alike. Recognized as a leading Dallas Fort Worth piano player, her technical ability, imagination and special touch further enables Laura to embellish music spanning many genres. Laura's feeling and passion for her music joined with her melodious material captures an immediate, emphatic response from the listener, sustaining interest throughout the duration of a performance. With the spirit of an artist, the SOUNDS OF LAURA remain long afterwards in the hearts and minds of her audience. www.partyplannerUSA.com "Party Planning Services-Fort Worth, Texas"
appear in the upcoming 2006/2007 "Honors Edition"
(DFW) was appointed as a biographical candidate to represent Fort Worth in the Empire Who's Who Among Executive and Professional Women. Laura will appear in the upcoming 2006/2007 "Honors Edition" registry. Laura's photograph titled "Little Bluestem" has been selected for the Art in The Metroplex exhibition to be held in September at the TCU Art Gallery. This is the 5th year that Laura's photography has been accepted into the Art in the Metroplex. This multi-talented adjunct professor also plays light classical, popular standards, classic rock, oldies, folk, light jazz, hit movie themes, etc. on her 88 key electric piano. To learn more about Laura's performances, you can visit her website at www.soundsoflaura.com.